For every great food spot, there’s a great place to enjoy drinks, too, from the toe-tapping Scott’s Piano Bar to the always-hoppin’ 70’s Dance Club. New libation hotspots include Alchemy Bar (cocktail magic central) and SKYBOX Sports Bar (the 50-yard-line of fun). An outdoor, seaside bar is practically a cruise ship requirement, and everyone’s favorite is here… whether it’s the RedFrog Rum Bar or BlueIguana Tequila Bar. (Or hey, both!) The rum bar’s older brother, RedFrog Pub, features drinks, live music and traditional pub games. Topping off adult-time is the one-and-(adult)-only Serenity Retreat, where total relaxation is not only encouraged, but pretty much required. If you’re a kid, Carnival Freedom means you’re in for a treat. Not only will you find new friends at one of three youth spaces like the all-new Camp Ocean but you can splash around with them in one of our many pools, speed down the Twister Waterslide, or once you dry off, challenge them to a round of mini-golf. Oh, and adults don’t get jealous; your inner kid gets to do all this stuff too! Up on stage is Playlist Productions, featuring songs you know and dance moves you’ll soon be using. And for a chance to get up on stage yourself, there’s Hasbro, The Game Show, where kids of all ages even you, grandma compete in larger-than-life Hasbro games come to life! And for the cherry on top… it’s actually called Cherry On Top. It’s the spot for something special, whether that something’s a little something sweet – or simply a little something to sweeten a special occasion. 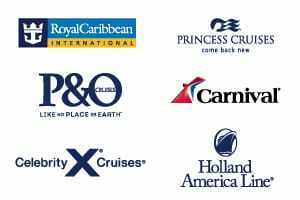 View all Carnival Freedom cruises or view more options for Carnival cruises. We went looking for someone to help us grill up the best burgers at sea, and we found just the guy. Carnival has teamed up with best-selling author, restaurateur and Food Network personality Guy Fieri to bring all the authentic appeal of a roadside burger shack to Guys Burger Joint, the cool poolside spot for hot burgers and hand-cut fries. Try a fresh-off-the-grill burger Guys way, or take it off-road to our toppings bar and truly make it your own. Nobody knows Mexican dining like a blue iguana. Well, our blue iguana, at least. Thats why it should come as no surprise that the BlueIguana Cantina features freshly made tacos and burritos stuffed specially for your enjoyment. Throw our homemade tortillas and salsa into the mix, and you have a casual dining experience that will make you say mmmm (“which is actually Iguanese for more, please”). Forget what “they” say – the most important meal of the day is brunch. Slumberers can sleep in and still enjoy breakfast favorites, while early-risers get a head-start on lunch. And Seaday Brunch brings everybody’s favorite mid-morning meal to your Carnival cruise, and does it right. You’ll enjoy huevos rancheros, special french toast, loaded mac-n-cheese… and yes, more ways to cook eggs than we even thought was possible. Chow down and fuel up – you’ve got lots of exploring to do, across the ship, for the rest of the day. “Hey, which side does the fork go on?” is a question you’ll never have to ask at a dining room dinner aboard a Carnival cruise… we set the table for you. We also bring to the table a full three courses in an experience that’s filling, but never stuffy – after all, you’re just as likely to catch waiters table-dancing as you are to order dessert. Dessert’s included (along with the rest of your meal, by the way) in your fare. But don’t skip straight to dessert, because the main course is the main attraction – drop in daily and enjoy a rotating menu of delectable favorites like steak, roasted duck, scallops and prime rib. Featuring a nice variety of casual dining options like Mongolian Wok, Chef’s Choice, Salad Bar, Carnival Deli and more, the Lido Restaurant has something – or more likely, at least a few somethings – to satisfy your craving. With plenty of indoor and outdoor seating, plus food options for everyone, you can enjoy your personal favorites in company of family and friends for lunch or dinner… or even breakfast! It’s also where you can find our pizza, soft serve and frozen yogurt – all open 24 hours a day, which ought to be enough for anybody. Tossing dough is an age-old art passed down the generations. Lucky for you, someone passed us the secret to the perfect pie. While aboard, this is the place that will shiver your timbers and warm you to the bone, 24 hours a day, with a Margherita, Funghi, Prosciutto, Pepperoni or Quatttro Formaggi pizza served with a delicious Caesar salad. Savvy? Then it is the pirates life for you! Our kids’ menus, available at most onboard dining venues, feature foods that are delicious enough – and fun enough – to satisfy even the pickiest of eaters. We’ve got all the familiar options they love from home, like spaghetti and meatballs, chicken nuggets, hot dogs, mac-n-cheese, peanut butter and jelly sandwiches and – yes mom – fresh fruit and veggies. They should save room for dessert, though, because with sweet stuff like banana splits and chocolate brownies, your young’uns are going to be pretty excited. There’s even 24-hour pizza and ice cream… but these are subject to bed-time, of course. Comedy clubs on land… well, it’s kinda funny. Nobody likes paying cover charges, and you know that two-drink minimum? They’ve gotta be joking! You won’t find either of these at The Punchliner Comedy Club aboard your Carnival cruise. Up on stage you will find some real pros who know how to wedge a little laughter into anyones evening. You can count on these comedians to not hold back either. Since some of them get up and say exactly what’s on their mind, we also schedule family-friendly performances… so the only red faces in the audience are from laughing a little too hard. Lets use our imaginations – just think what would happen if we took a normal library and put it through one of Dr. Seuss’s wacky contraptions… set to maximum fun, of course. It would probably come out looking much like Dr. Seuss Bookville, which as you can imagine, is exclusively aboard Carnival! The room is all decked out in bright colors, fun and whimsical furniture and even has some of your all-time favorite Dr. Seuss characters on the walls. But lets not forget that this space is all about the books – the shelves are filled to the brim for hours of fun reading. When was the last time you got up and danced… at the theater? Playlist Productions takes tunes you know and presents them like you’ve never experienced before – past favorites become full-blown musical productions featuring singers and dancers bringing down the house. Enjoy the spicy sounds of Latin Nights, or the larger-than-life favorites (and personalities) of Divas. Don’t forget Motor City – which will have you dancing in your seat – or even The Brits!, a swingin’ revue of your across-the-pond favourites. Enter the center of groove with the passionate Heart of Soul. Rounding out the lineup is the anything-but-square Getaway Island, the arena-shaking sounds of Epic Rock, the piano-pounding 88 Keys, the totally bad-meaning-good 80s Pop to the Max, plus the funky, sophisticated… and not at all exclusive Studio VIP, where everyone’s welcome to come and get down! Ready to see stars? Park yourself in front of the big screen – the really big screen – and settle in for a night at the cinema under some real stars. From the comfort of your poolside lounge chair, or even the pool itself, you’ll enjoy the most recent blockbuster movies from categories like Comedy, Action & Adventure and Date Night. And don’t think that being in the middle of the sea means going without the usual comforts. There’s not only popcorn – who could forget that? – but blankets! So lounge around, snuggle up and try to remember the last time you truly enjoyed a night at the movies. Everyone has their own idea of what a perfect cruise vacation is. That’s why Carnival believes in giving our guests a variety of entertaining options – one more fun than the next. Looking for some quiet time with the other adults? 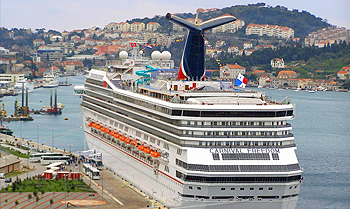 Carnival Freedom is the first Conquest-class ship to feature the Adult-only Serenity Retreat. Prefer to stay close to the spa and still have a personal view of the sea? Eighteen of Carnival Freedom’s Spa Deck Ocean view staterooms now feature private balconies. We’ve also made it easier for your 12-14 year olds to have fun their way by adding their own “chill out” spot; Circle “C.” And for the ulitmate in freedom of choice, Carnival Freedom will unveil “Your Time Dining” in early 2010. Remember, it’s your choice to do whatever you want – even if that’s nothing at all! Exercise your right to choose. 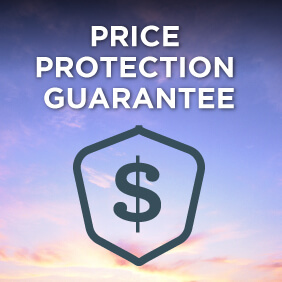 Book your cruise aboard Carnival Freedom today!